Over the past 20 years, I’ve had the privilege to work on scores, if not hundreds, of software projects. Between consulting work and full time jobs, I’ve been able to help bring to fruition the ideas and goals of many partners, clients, and employers. But what I’ve come to realize over my career is that no matter how novel, how challenging, or even how lucrative a project is, it’s never as satisfying as working on one’s own ideas — even if those ideas are a miserable failure. That has lead me to a hierarchy I call The Pyramid of Software Developer Job Satisfaction. And it’s led me to build Nimble Industries in search of that mythical, penultimate job: Building and working on my own idea as a full time income source. Moving up the pyramid are products one builds that are a success but, at the end of the day, are someone else’s success. Maybe even a smashing success! A worldwide hit! You go public, your stock vests, you cash out! But is it ever better than working on your own products, as your own boss? I think not. The question, then, was how to work on more of my own ideas? First of all, but not giving up the day job. Or in my case, by not dropping my consulting work entirely. In order to have time to invest in myself, I must continue to monetize my skills in the most effective way possible and that means, hourly work. But with Nimble Industries, Andy and I made a conscious choice to dedicate our entire company to software products of our own: Not consulting, not hourly work, not other people’s ideas – only our own. Individually, we will continue to consult, but Nimble Industries is a product company from day 0. Instead of getting stuck in the age-old struggle of turning a consulting company into a product company, we will start with products. The energy we spend on the business will not be spent on typical consulting company-changes: growing the pipeline of leads, hiring more developers, or squeezing out more utilization. Instead, every minute of time spent on Nimble Industries will be spent on our own SaaS products. Even if our products are a failure, I’m confident I will derive more personal satisfaction from building them than I ever will consulting for others. 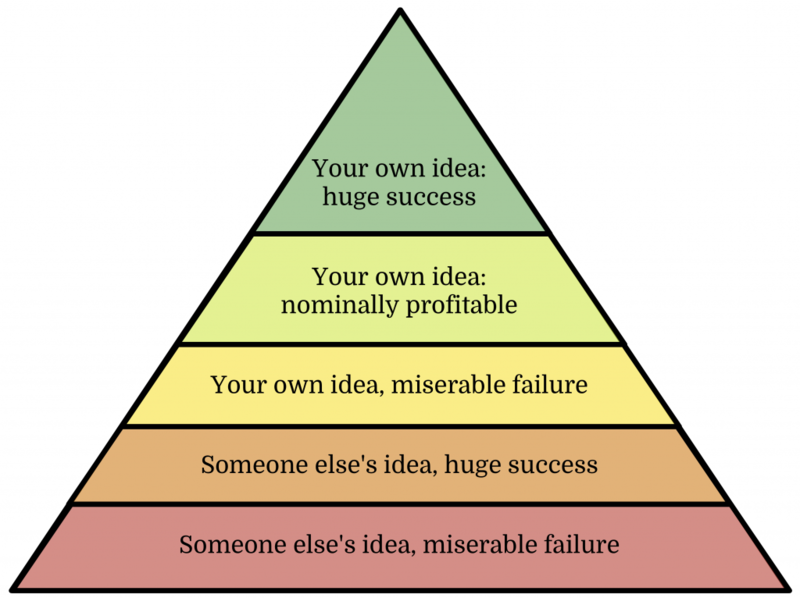 With dedication, and a very nimble effort, I believe we can climb the pyramid to the top: Our own ideas, a huge success.